Changing gears...let's talk kitchens! This client is one of my favorites! We've made many changes to her home, but the biggest change was in the kitchen. 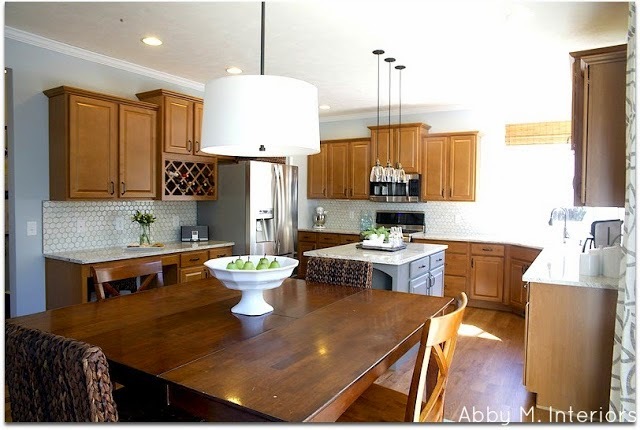 You may remember this kitchen from July of 2013. We made many changes! But the cabinets stayed as is. After the transformation, you may remember it looked like this. 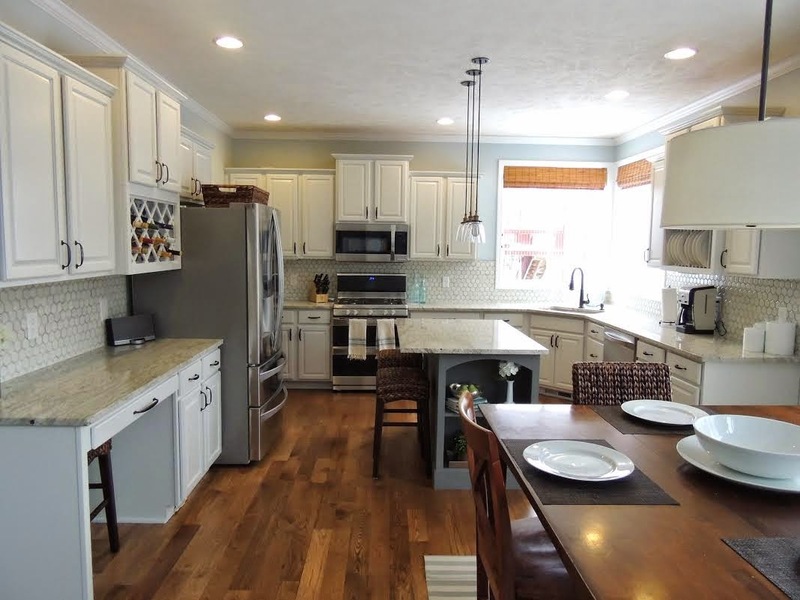 Lori was gracious enough to take pictures of her light and bright kitchen. She told me she's very happy with it and can't believe they waited so long. What do you think? I know I am inspired to bite the bullet and get our cabinets painted. But which do you prefer? I love it! It looks like a totally different kitchen - so crisp and fresh! We are remodeling our kitchen soon and are going with white cabinets as well. Such a classic look. 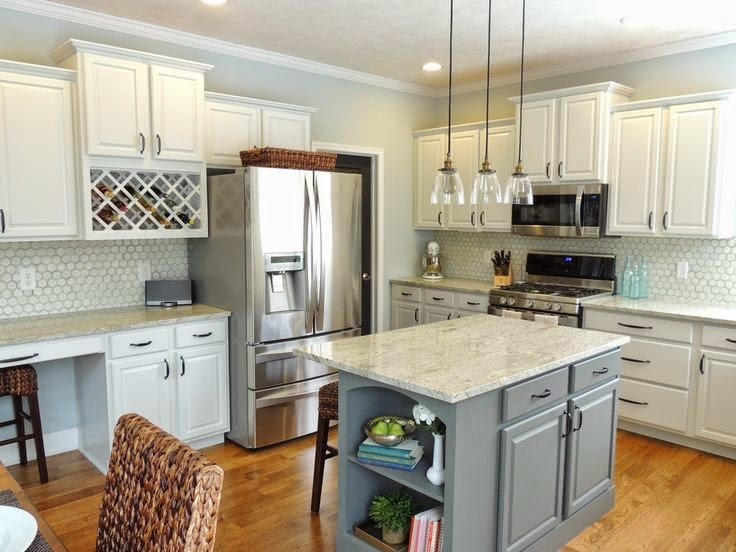 Love the cabinet paint color! It all looks great! Oh that is really lovely. I am glad you were able to lighten the room without having to purchase all new items. I love the backsplash and new countertop. And changing out the lighting and rug along with the paint made this room so bright and sunny. Thank you, Connie! I'm so glad you like it. It looks fabulous Abby. 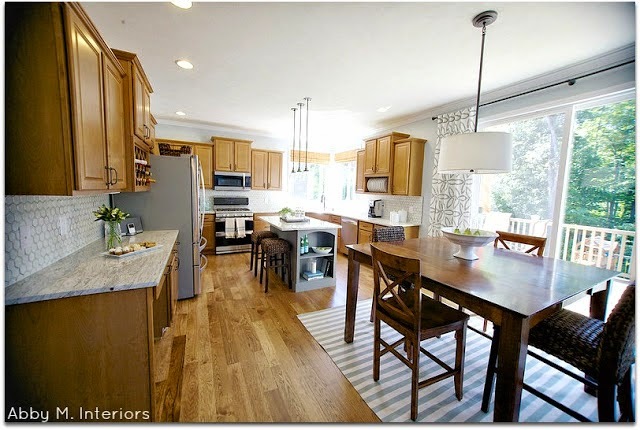 I actually like the wood tone cabs too, and I am a white-kitchen loving girl. But the initial changes you made with the backsplash and the cooler shade on the wall and curtains balanced the wood so well. It looks so so so pretty, light and bright now though! 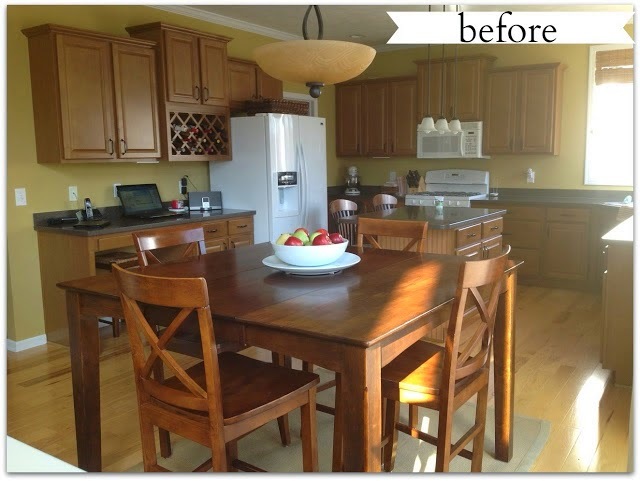 The lighting alone made a big change but painting the cupboards also had a huge effect on the overall update. 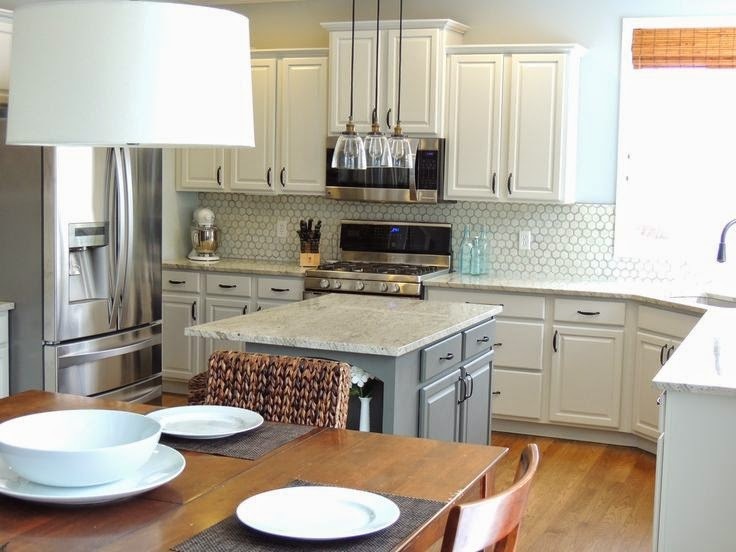 I love the client's choice in countertop and backsplash. Nicely done. Thank you, Pamela! I actually presented the granite and backsplash to my clients during phase one, and thankfully they approved bc they work lovely together. Thanks for reading! I'm biased towards painted cabinets since mine are. I also love the lighting you changed! Me too! I love painted cabinets and sadly, since we moved into this home 3 years ago I still have the same honey wood toned cabinets. Some day! I love it! Go for it! 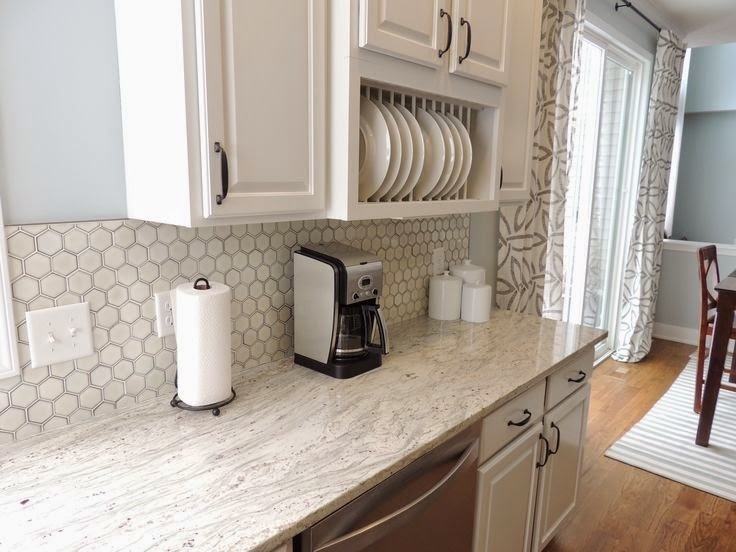 I usually like white subway tile with white cabinets but I love the tile they chose! Did you have a professional painter do the cabinets? I have heard it is a lot of work. It looks fantastic! 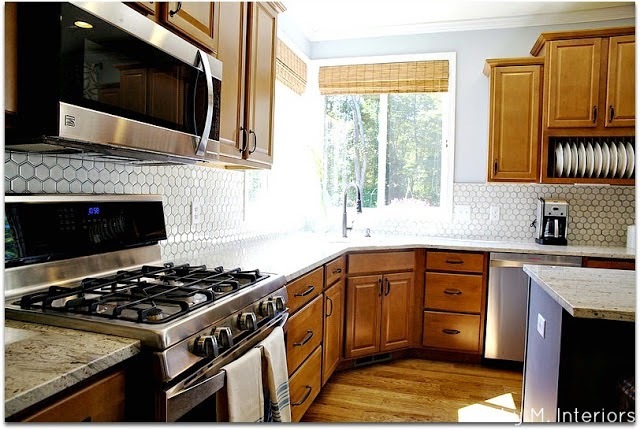 I love white cabinets and how you have transformed this kitchen. Great work! The white is just perfect! I think all the same wood tones were a little too flat before. 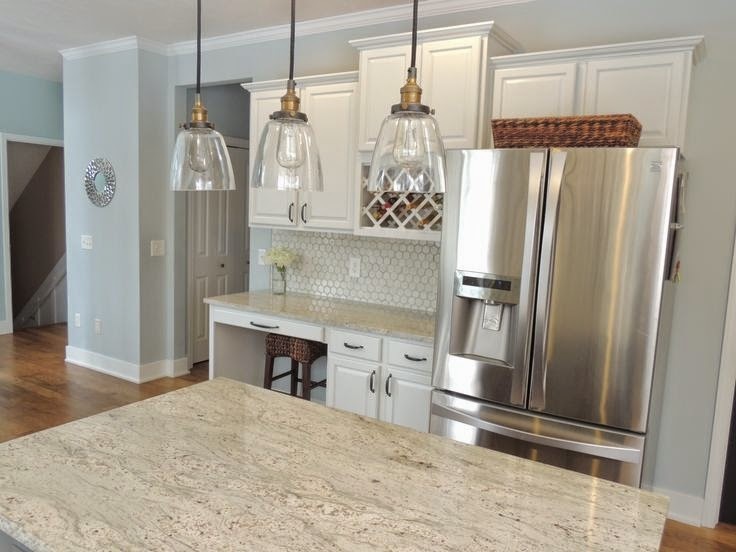 The white cabinets just really make that kitchen shine!